Yesterday, Mozilla announced the launch of v2.0 of their Web Literacy Map. You can read about this in a post entitled Introducing Mozilla’s Web Literacy Map, Our New Blueprint for Teaching People About the Web. The map is visually different from version 1.5, as it’s represented in a wheel rather than as a table. Another difference is that the Explore / Build / Connect strands are replaced with Read / Write / Participate (which was present in the subtitles of the previous version). The 16 competencies around the outside of the circle are verb-based (good!) and aren’t too much of a departure from the 15 competencies of the previous version. 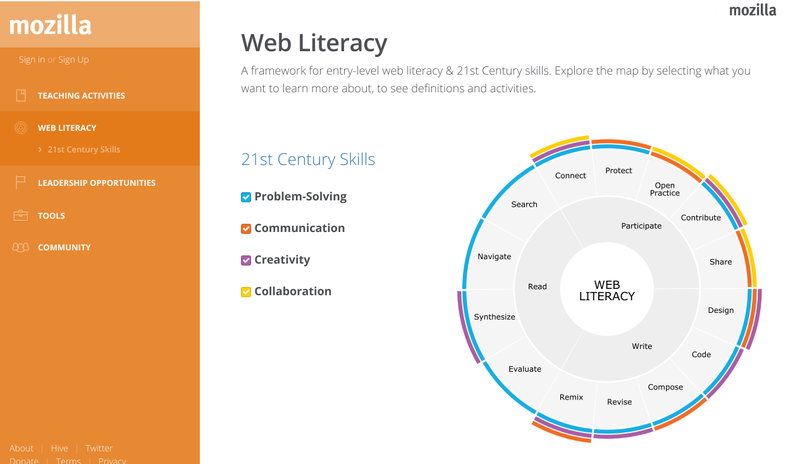 Version 2.0 of the Web Literacy Map is interactive. When you click on part of it, you can see which sub-skills make up each competency, as well as which 21st-century skills it aligns with. Most helpfully for teachers, you can view activities that align with teaching this particular competency. It’s done well. I’m pleased that version 2.0 of Mozilla’s Web Literacy Map is both a continuation to, and an important update to, previous versions that the community help produce during my years with Mozilla!